During the Foundation’s annual architectural tour of the Landmarks of Española Valley on Oct. 24, participants will learn how community partnerships have helped ensure these historic structures are preserved for future generations. The following individuals will be the featured presenters for each tour location. Francisco Guillermo “Willie” Atencio is a life-long member of the Santa Cruz de la Canada Parish. Willie retired from Los Alamos National Laboratory in 1993 at which time he began working at the Bradbury Science Museum. For more than 20 years, he has researched and documented the participation of the people from the Santa Cruz area during the Manhattan Project in Los Alamos. In preparation for the 250-year celebration in 1983, Willie was appointed to serve on the book committee, which published the book La Iglesiade SantaCruz delaCanada, 1733-1983, and also the committee that published the 300th Anniversary of Santa Cruz dela Canada Parish and in 1995, the 75th Anniversary of Sons of the Holy Family at Santa Cruz. 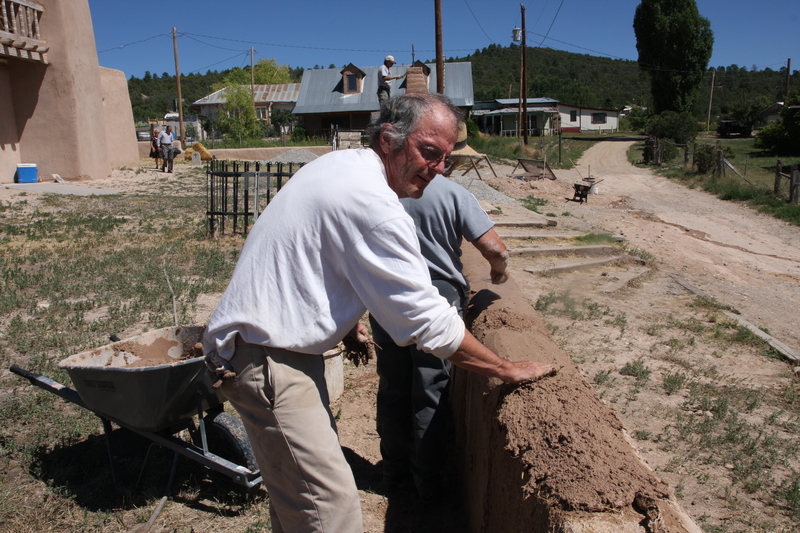 Dan Jaramillo is a life-long resident of Chimayo, NM. His ancestors came with the early Hispanic settlers of north-central New Mexico. He has been a student of New Mexico history and culture all of his life. Dan has written articles, spoken to groups, and led tours on the subject of Chimayo. He is a founding board member of the Chimayo Cultural Preservation Association, which established the Chimayo Museum in 1995. He has been the curator of the museum for the last three years. Jake Barrow is the Program Director for Cornerstones Community Partnerships where he works to provide heritage preservation leadership and technical outreach services to communities. He specializes in wood, timber, log, stone and adobe preservation. He joined Cornerstones in 2009 after retiring from a thirty-year historic preservation career from the National Park Service. He is the 1996 recipient of the Appleman-Judd Award for Cultural Resource Stewardship in the NPS. He received the 2002 New Mexico Heritage Preservation Award and in 2015 he received the New Mexico Lifetime Achievement Heritage Preservation Award.